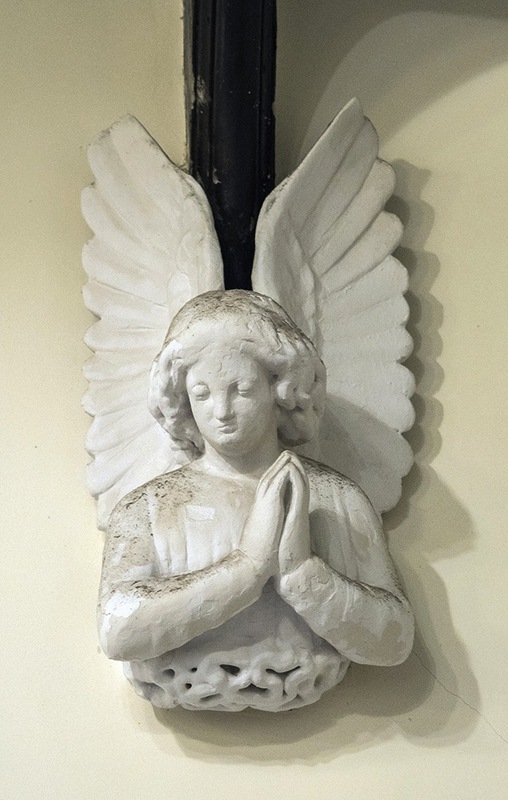 Recent photographs by George P. Landow and John Salmon (see initials). Text by Landow and Jacqueline Banerjee. 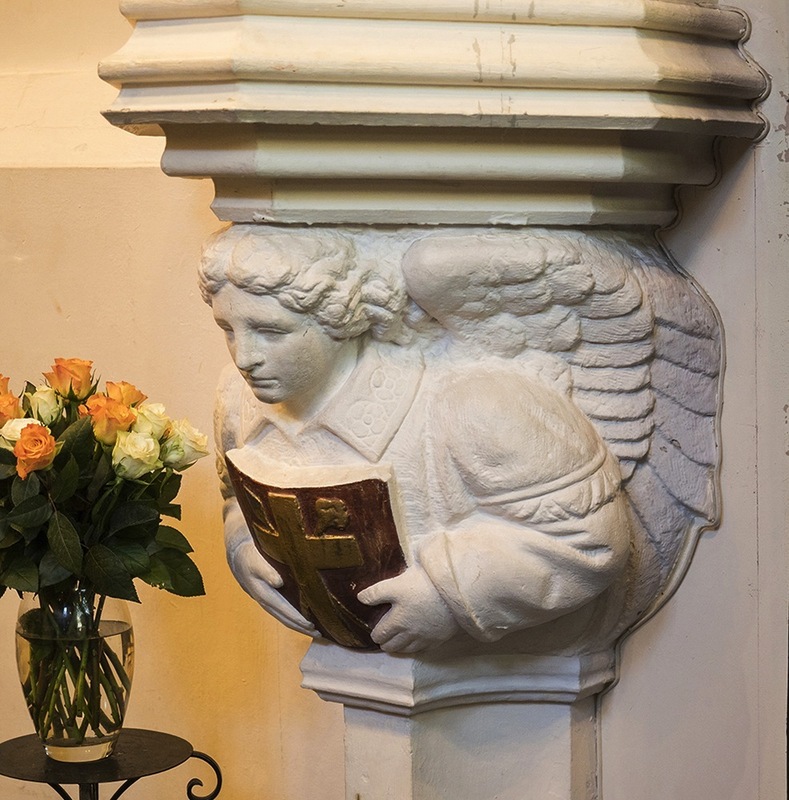 You may use the images without prior permission for any scholarly or educational purpose as long as you (1) credit the photographer and (2) link your document to this URL in a web document or cite the Victorian Web in a print one. 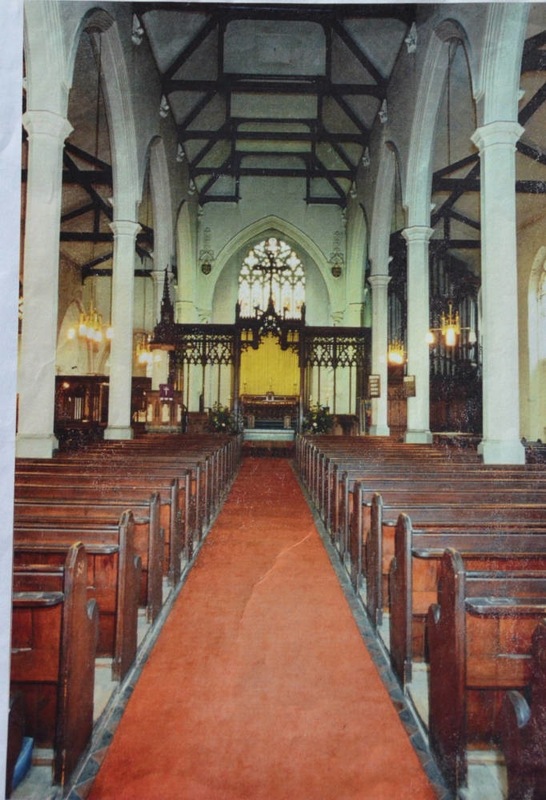 Left to right: (a) The original interior of St Saviour's Church, from an old photograph. (b) A glimpse of the east end now [JS]. (c) Looking west [JS]. Left to right: (a) Sedilia and piscina to the left of the entrance [GPL]. 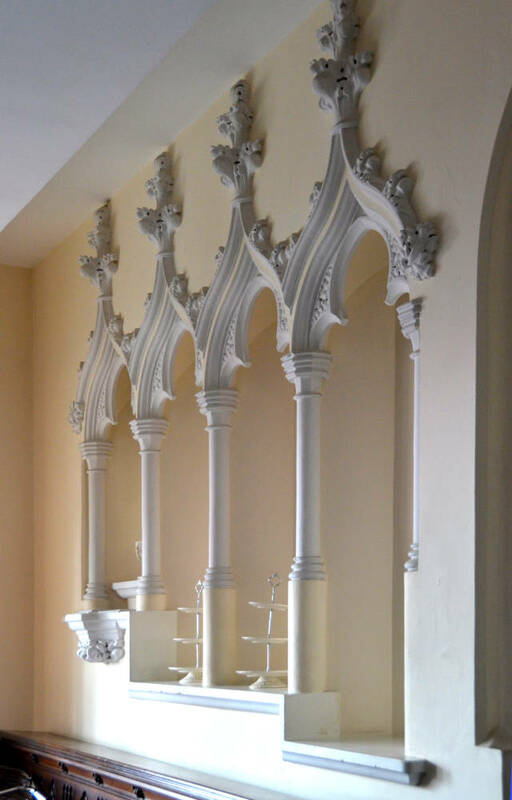 (b) One of the corbels [JS]. 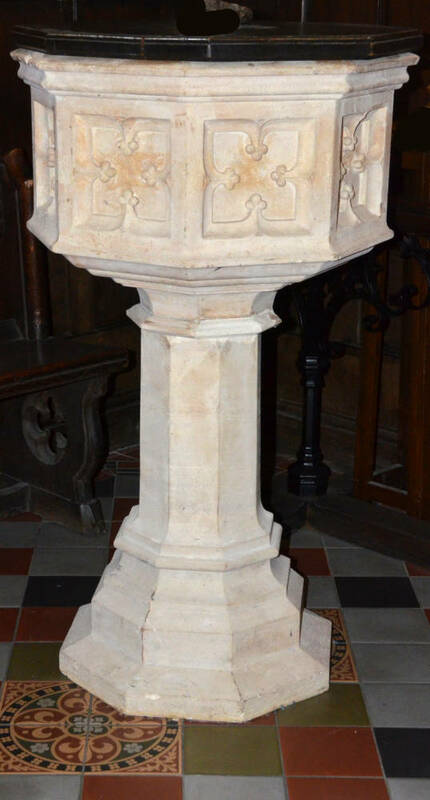 (c) Stone-carving on a capital, probably from the chancel arch [JS]. 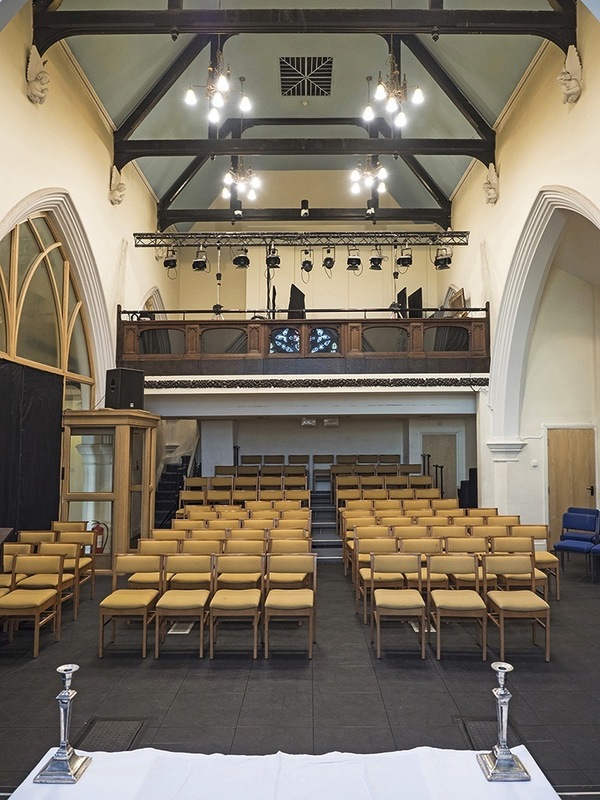 However, the sedilia and piscina to the left of the entrance, corbels (seen high up in the older photograph above left) and various other elements remain, to remind us of what the church once looked like, and the skills that were employed in creating the original Gothic Revival house of worship. 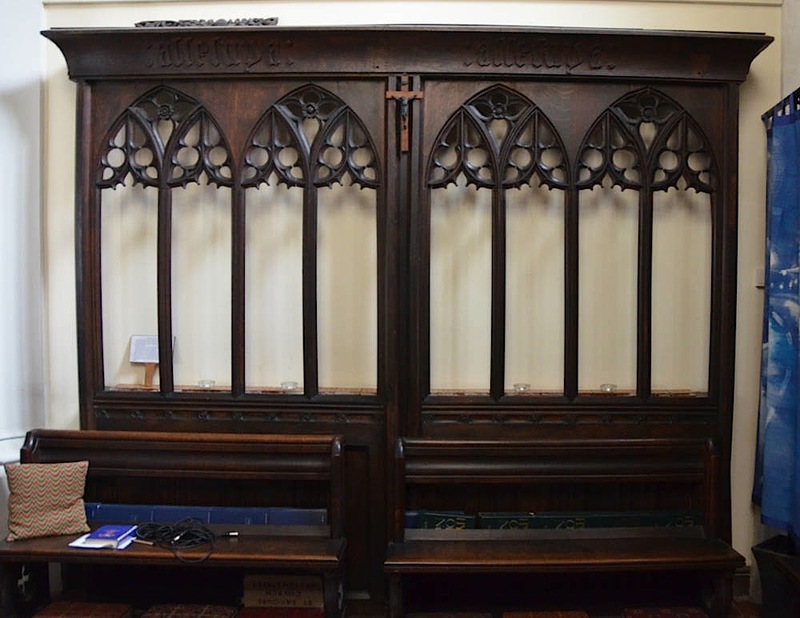 Left to right: (a) Choir screen [JS]. 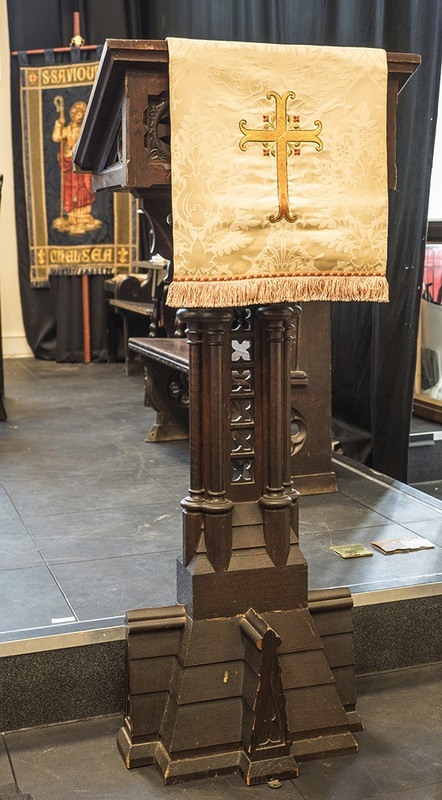 (b) Lectern [JS]. 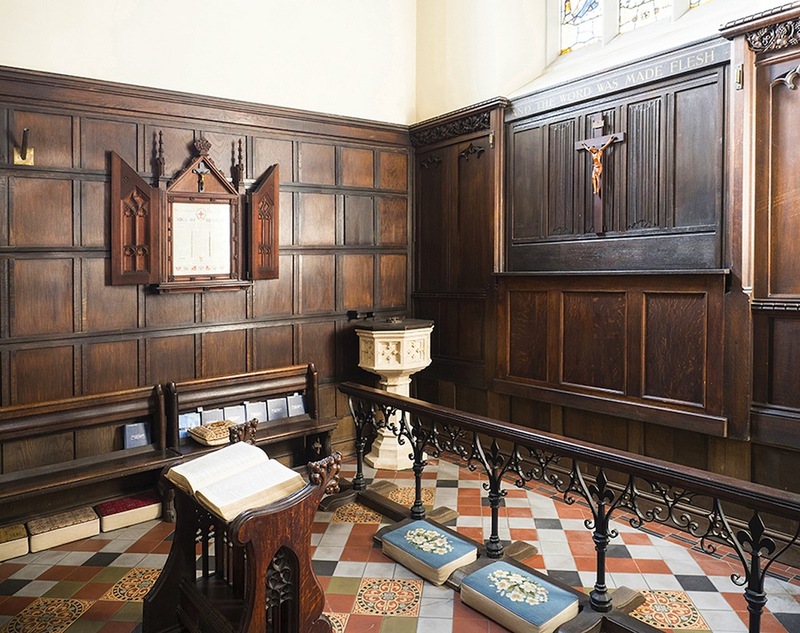 (c) Looking into the north chapel [JS]. 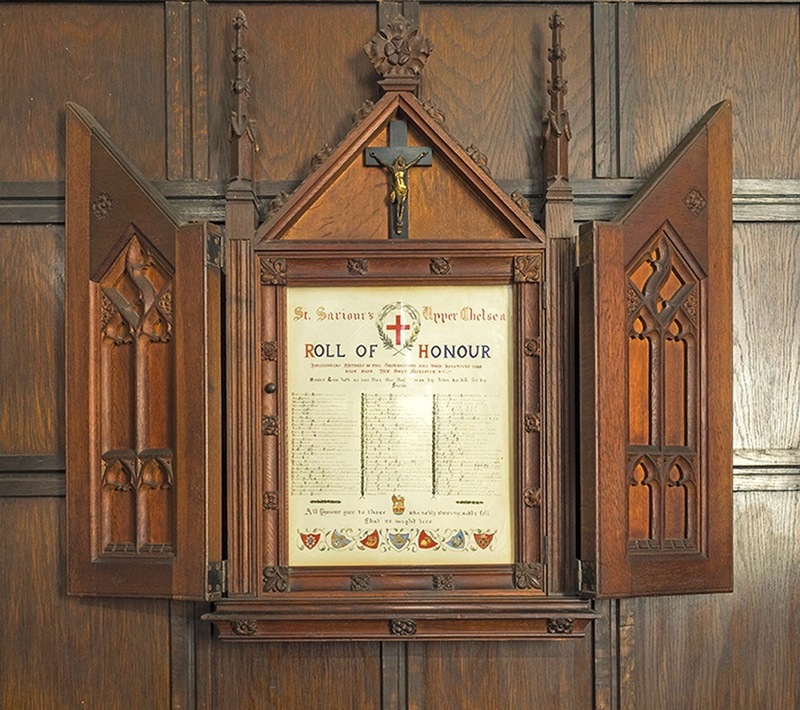 On the wood-panelled wall, visible towards the left of the view into the chapel (and also in the first photograph below), is a memorial "Roll of Honour" for the war dead of "St Saviour's, Upper Chelsea." Click here for a view of it. Left to right: (a) Looking towards the north-east [JS]. (b) The font, which is still in use [GPL]. 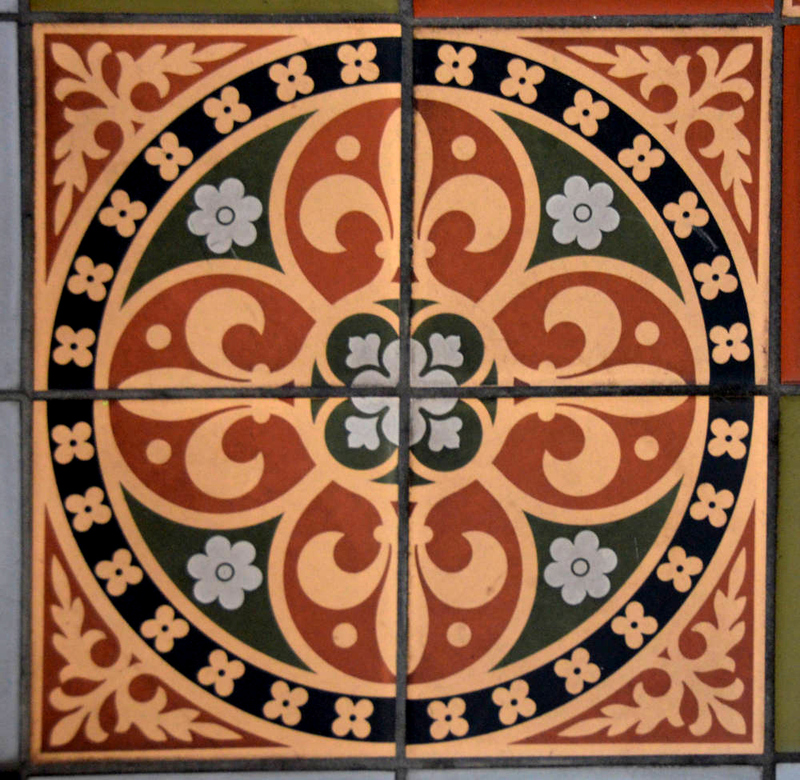 (c) One of the richly patterned encaustic tiles [GPL]. 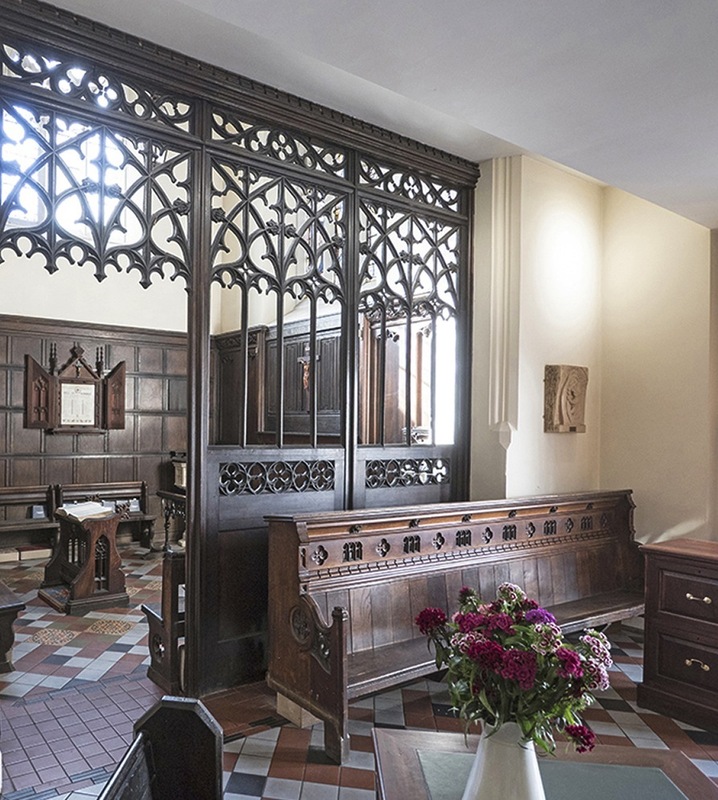 Note the fine fleur-de;lis ironwork of the low altar rail. Beside it on the right is the candlestick shown on the right below — another fine piece of metalwork [photographed by JS]. 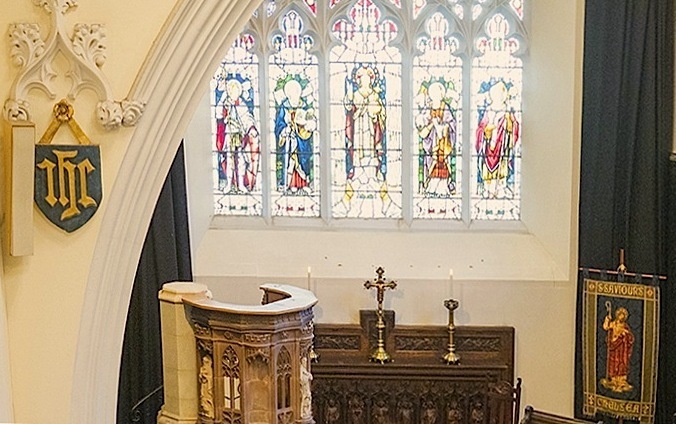 Despite the surviving elements of the church, it is hard to imagine what it must have looked like in the nineteenth century, when (for example) the congregation was large enough for an organ to be "installed in 1899 by Norman and Beard at a cost of £928," and the Communicants Guild paid for memorial stained glass — including that of the beautiful east window, which was in honour of Queen Victoria's reign, and cost £380 in 1904 (explanatory note). It is a shame that only two of several stained glass windows remain visible after the division of the church (see Eberhard).